Chief Justice Bart Katureebe (left) makes his presentation at the Commonwealth Magistrates and Judges Association Conference in Tanzania today. Courtesy photo. KAMPALA–Although the Universal Declaration of Human Rights proclaims equality of all human beings before the law, Uganda is short of effective, inclusive and accountable Judiciary, the Chief Justice Bart Katureebe has revealed. 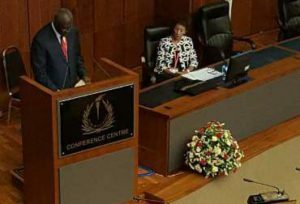 Presenting a keynote address at the Commonwealth Magistrates and Judges Association Conference at the Bank of Tanzania Conference Centre today, Katureebe said the justice system remains elusive especially to the vulnerable and marginalized persons. He blamed this on institutional and other challenges among which include limited funding. “The primary objective of the Judiciary is to provide a mechanism for peaceful settlement of disputes through a rule based settlement mechanism, where aggrieved persons have a level playing field to present and argue their cases before an impartial judge / tribunal instead of resorting to extra judicial methods that predate the rule of law,” he noted. However, this has been hampered by various challenges; Internally, the Judiciary faces the challenge of delay in disposing of cases, corruption both real and perceived, high prison congestion, increasing case load, among others. “It is a common fact today that there is a two track system in the administration of justice. The first track is for the rich and privileged while the second track, which is the slowest, is for the poor and most disadvantaged. And against that background, Katureebe said Uganda’s judicial system has come up with several measures to see that justice is fairly dispensed to all people. “The public is concerned about the high cost of accessing justice and most Judiciaries are, therefore, seeking ways to bring down the cost of accessing justice for 90% of the population in the developing world who cannot afford a lawyer . “In order for us to create an inclusive judicial system, we must address barriers which the poor and vulnerable face in accessing the courts. The first point of call is to sensitise the poor and vulnerable to use the justice system. Secondly, the poor must be given a voice, so that they can raise and claim their rights. The justice sector is also undergoing rapid changes made possible by advancements in management, technology, democratization, rising levels of social consciousness supported by cross fertilization of legal principles and best practices within the Commonwealth and the world at large. “We have introduced performance targets for all judicial officers. They have as well adopted a systematic way of engaging all stakeholders on a monthly and biannual basis.